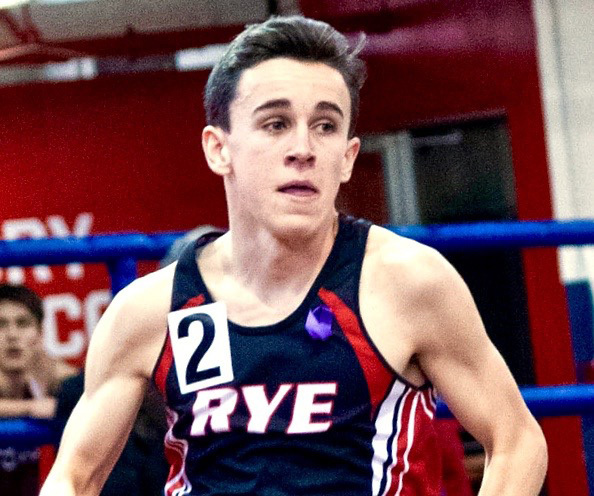 Seven times this winter season, members of Rye High’s track team got into their cars and drove into the city for indoor meets on their “home court”, Upper Manhattan’s Armory track. Two weekends ago, they were joined by runners, jumpers, and throwers from all over the country at the New Balance High School Nationals. The Garnets entered two 4×800-meter relay teams—four boys and four girls—in the Emerging Elite Division, which raced Friday afternoon. The EEs are to the National Championship races on Sunday what Triple-A baseball is to the Majors— one small step down. In addition, Rye’s anchor leg—Cian Galligan—was also entered in Sunday’s big race, the Boys’ Championship Mile. The team of Bradley Squarek, John Goldszer, Thiago Hammes, and Galligan finished sixth in a time of 8:05.56, three seconds off the medal stand. Meanwhile, the girls’ 3,200-meter squad came in 10th. Rachael Adelson led off, handing the baton to Catriona McWilliams in fifth position or so. She gave it to Philippa Emms, and Elena Perez-Segnini brought it home in 9:39.26. Forty-eight hours later, Galligan was back, toeing the starting line in the race that would bring together some of America’s best high school milers. He got there thanks to the 4:16.04 he ran at the New York State Championships in the 1,600-meters, nine meters short of a mile. At Sunday’s race, the Dublin-born Galligan wore the old cotton singlet his grandfather had on while running for University College Dublin back in the 1940s. This time, that old jersey (and the Garnet inside it) ran with the pack until everyone sprinted for home. His time of 4:17.59 would make Galligan the first finisher from New York State and place him 18th in the country. With the start of the outdoor season about to start, Rye coaches John McGee and Blair Moynihan expect all those times to come down even more.